Once upon a time, I caught 'em all. I had every single PokÃ©mon - every starter, every evolution, every legendary - from every generation of the series. My collection was complete; I was a true PokÃ©mon master. Once upon a time, I was a cheater. I wasn't always a cheater, of course. To understand my fall to the dark side, let's jump back a bit: The year was 1998. Back then, I was just a collector - a completionist. If a game challenged me with any number of shiny trinkets to acquire, I wanted them. 120 stars in Super Mario 64? Can do. All the Jiggies and Notes in Banjo-Kazooie? You bet. It was then that I learned about a new game - or rather, two new games - about to hit North America from Japan. Commercials for PokÃ©mon Red & Blue Versions (and all the related tie-in products) flooded the airwaves, boasting 150 little (and not-so-little) monsters for the taking. Even from the beginning, though, it was a challenge that was all but impossible to complete. At their core, the PokÃ©mon games are all about capturing wild monsters, training them and battling with them. Though the series initially sported the tagline "Gotta Catch 'Em All," Nintendo never seemed inclined to let players do just that. With every successive "generation" of PokÃ©mon games, the roster swelled with the addition of new characters: Gold and Silver versions (Generation II) added a hundred more to bring the total number of monsters to 251, and Ruby and Sapphire versions (Generation III) took it even higher, to 386 potential characters to catch. By the time I cheated my way through PokÃ©mon Pearl, the series was on its fourth generation, with a staggering 493 monsters in total to catch. If that were the only barrier, it would be a problem that could simply be solved with enough time and effort. 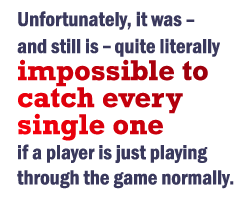 Unfortunately, it was - and still is - quite literally impossible to catch every single one if a player is just playing through the game normally. From the earliest days of Red and Blue, the franchise has divided its roster of characters up between the two versions. Most of the monsters are in both, but some are only found in one - whereas Red had the puppy PokÃ©mon Growlithe, Blue had the fox Vulpix - and the only way to acquire them is to trade with another player who has the opposite version of the game. That wasn't much of a problem in itself: If you were a kid in junior high school in 1998, it was a safe bet that you'd be able to find whichever version you didn't have yourself among your classmates.